Microgreens are tiny and quickly growing green vegetables. It’s no big surprise why kids simply love them for their cuteness in size. Usually used as a garnish or even as the main ingredient for lots of dishes, especially fine dining. Aside from that, microgreens are full of healthy benefits. We’ve created a mouthwatering Microgreens recipe that the kids will love too. 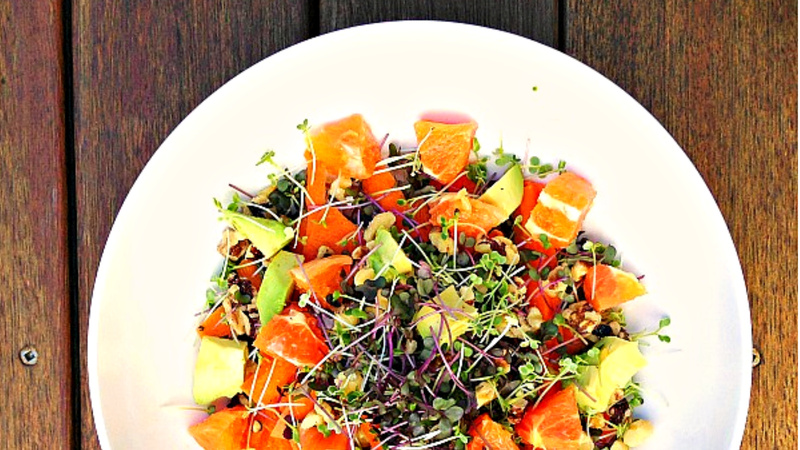 Introducing our fresh and foursome Microgreens & Orange Salad. You can also check out another microgreens recipe your family will love. Once you start enjoying microgreens, you’ll find lots of ways to enjoy them. Don’t worry about searching for Microgreens in the supermarket because they are super easy to grow yourself. You can grow your own Microgreens garden with your kids. They grow really fast and their small size means you can grow them inside on the kitchen windowsill. Check out our awesome microgreen kits here. Bursting with flavour this bright and tangy combination of microgreens and orange will be a hit with the kids as well. Enjoy as a side salad with your family and friends or simply on its own. Refreshing, tangy, healthy and delicious all at the same time. 1 orange, peeled and cubed I used a Rudy Red variant for colour. salt & pepper if you are up for it, add a small amount of finely chopped garlic. Lightly mix the salad ingredients together, and drizzle over the dressing.